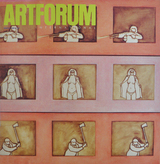 In the pages of this continuing series (inaugurated in the September 1989 issue) Artforum invites a range of critics or theorists to articulate what they see as the role and responsibilities of art criticism today. Amateur: None of the grade-school aptitude tests devised to date will steer its subjects toward the vocation of art criticism, and those slightly older scholars who attempt to prepare themselves would do best to study sociology, anthropology, or German literature—anything, in short, besides criticism. The best writing about art, I believe, comes from those whose training derives from looking at art, lots of art, and not from studying how to look at art. Order the PRINT EDITION of the March 1990 issue for $17 or the ONLINE EDITION for $5.99.